Matt Mink at Automatic Accuracy carries an RLN holster and mag pouches for the P-09. Nice rig. High Noon Slide Guard, takes a little breaking in, but what a smooth ride. I have a Don Hume 721 made for a 4 inch XD 40 that fits both guns perfectly. Got mine in. Like it better than my than Blade-Tech and my Shadow fits too ! Checked with Bade-Tech today, and they do not currently offer a OWB for the P-09. It occurred to me that any holster for an SP01 would likely be fine for the P-09, as the dimensions for width are identical and nearly the same for OAL. Anyone have any experience using a P-09 in a SP01 holster? Weird as it sounds my SP-01 will fit in the RLN holster, but the P-09 won't fit my Comp-Tac International for the SP01 - too tight. Maybe it could be loosened enough, but haven't tried. i think that the P09 slide is wider than the SP01 slide. i know my P07 is wider and i'm guessing the P09 slide is the same width. All you want, Italian leather and made in Turkey. http://www.jbpholsters.com/servlet/StoreFront Tagua also has holsters for them. Try to carry a fullsize that big IWB and it will kill you, but if you must, Tommy Theis has it. That's what I was concerned about, as the holsters made specifically for a model like the SPO1 will not fit the P-09 due to width of the slide. Both Blade Tech and Comp-Tac currently do not make belt holsters for the P-09. Reason I'm looking at those two brands is that I want to eventually shoot the P-09 in IDPA, and those are the two holster types I prefer for that use. P-09 is new, so I realize it's still early to have a variety of holster models. Spoke with Blade Tech today, and they indicate an OWB holster for the P-09 is almost ready. They said to check back with them in a couple weeks. Good news. Awesome, can't wait. Any idea if they'll do a light bearing option? 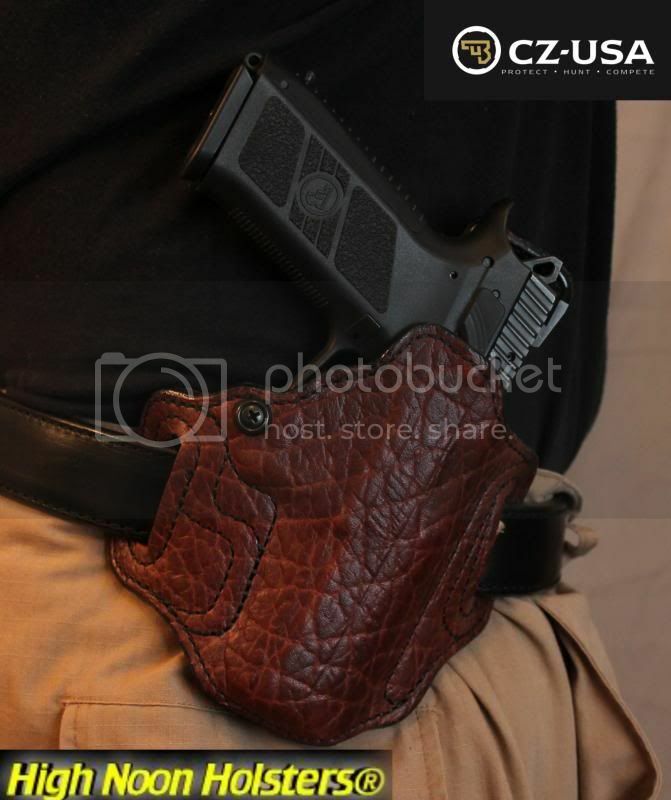 Ordered the holster and magazine pouches last night. Picked up my second P-09 Tuesday.